In this release of IBM Cloud Developer Tools CLI, we have enhanced the create command to include creating an application that uses IBM Cloud Functions. Using the create command, you can now select a Cloud Functions-based application for Node, Python with Flask, and Swift. We have also added the entire suite of Starter Kits available from the IBM Cloud web console to IBM Cloud Developer Tools CLI. Some Starter Kits do not yet support local build and run, but can be created with create and deployed through the use of a toolchain from the command line. 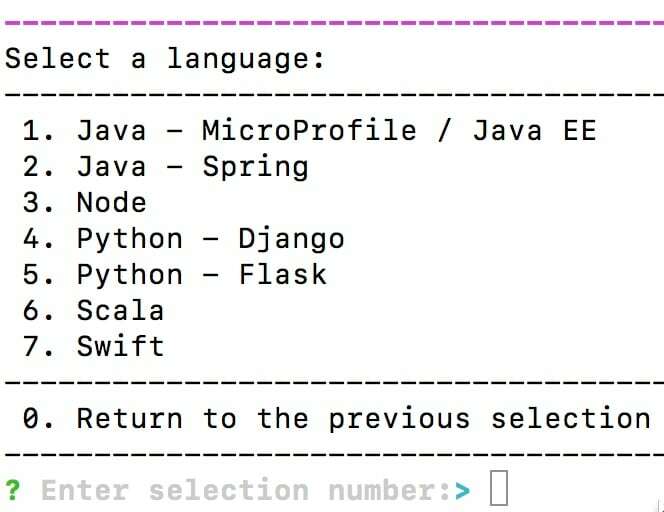 Also, as depicted in the image above, the Scala language is now supported by IBM Cloud Developer Tools CLI. Start developing your cloud applications with IBM Cloud Developer Tools CLI today!